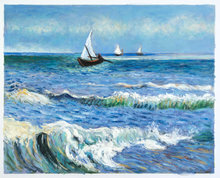 This painting, portraying the seascape near the fishing village of Saintes-Maries, was done by Van Gogh when he took a one-week trip during the time he spent, living in Arles, France. We have a team of skilled artists who have studied and mastered the techniques used by Vincent Van Gogh in his stunning pieces of art. 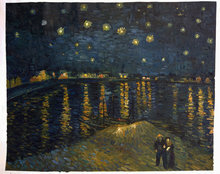 Creating authentic reproductions of Holland’s most revered artist is something that we do proudly. Vincent Van Gogh is known to have created this masterpiece in 1888 when he took a small trip to the sparsely populated fishing village of Saintes-Maries on the coast of the Mediterranean Sea. Small grains of sand found under the layers of paint tell us that Van Gogh painted this magnificent image of the sea and boats when he was sitting on the beach. 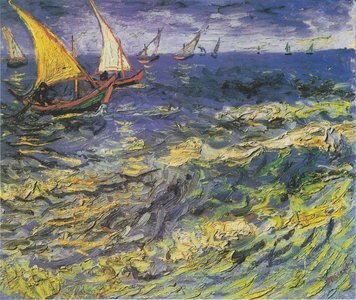 In a letter to his brother Theo, Van Gogh mentioned how the ever-changing colour of the Mediterranean Sea had reminded him of mackerel, and inspired him to paint the sea. 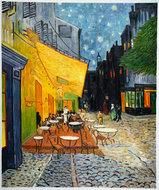 The focal point of this painting lies in Van Gogh’s amazing ability to bring a sense of life to his paintings. The effect created by the reflection of light on water was ingeniously achieved by combining a brilliantly vivid palette of contrasting shades. Van Gogh actually used a palette knife to apply these colours onto the canvas to achieve the visually enchanting effect of reflecting light on the waves of the Mediterranean Sea. 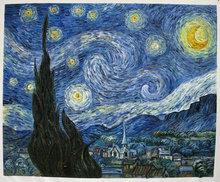 Vincent Van Gogh is no doubt one of the greatest post-impressionist artists known to the world. Like all of his other works, this painting too immediately captivates the gaze. The multiple colours that constitute the sea are a delight to the eyes. Getting lost in the brilliant canvas textures is an inspiring and invigorating experience.